The Ritchie Leather 1911 Belt Speed Scabbard features and open top design, outside the waistband, 1.5" belt loops, wet molded, hand boned and a 15 degree cant. Comfortable while pulling the pistol in tight to your body. Will fit 4" and 4.25" 1911's. Right Hand. Beautiful holster, very small and lightweight. I’m using with a Springfield EMP4 and the fit is tight but with a little break In is now perfect. Great service from TGS as always, very fast shipping. This holster is perfect for my colt commander . Retentive n is outstanding . As for quality Ritchie gunleather is one of the best in the business . A small 3 man shop out of upstate NY fit finish and fix toon are absolutely superb . Get yourself a good leather belt sized for these loops and the gun just disappears I personally use a milt sparks belt. 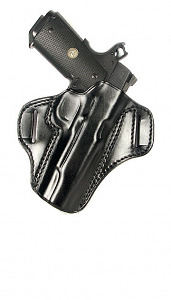 I carry a firearm at least 14 hours a day everyday this holster makes it comfortable .